Being recognized by TIME magazine as one of the Top 50 Inventions of 2011 may not be enough to boost Ascent Solar Technologies, Inc. (Nasdaq : ASTI) back to the $26.75 per share price it had in December of 2007, Ascent has had a nice run recently gaining 77% from January 10-18 already this year. Founded in 2005, Ascent Solar Technologies has made its mark in the solar industry using its proprietary technology with its flexible photovoltaic (PV) modules. The manufacturing process deposits multiple layers of materials, including a thin-film of CIGS semiconductor material on a plastic substrate and laser patterns the layers to create interconnected PV cells or PV modules through monolithic integration process, in its design-winning roll-format PV modules. Starting the Year out with a boost from the company’s largest insider, China’s TFG Radiant Investment Group, Ltd., was surely a step in the right direction for Ascent Solar. TFG Radiant, owner of roughly 20% of the outstanding shares since August, 2011, will be closing the deal on an already announced $4 million purchase at approximately $0.50 which is currently owned by Norsk Hydro Produksjon AS. The boost in Solar has been fueled by recent news from two of the world’s leading countries pushing their future energy dependency on the sun, Germany and China. Surely the recent surge in volume and price of 77% is most likely the squeeze of the December 30 1,124,898 short interest holders. However, Ascent Solar continues to push through in the solar energy sector which recently saw the likes of Warren Buffett’s Berkshire Hathaway make a huge jump into the solar energy sector with its purchase of First Solar, Inc. (Nasdaq: FSLR). Based in Thornton, Colorado, Ascent Solar’s stock is traded under the symbol ASTI on the Nasdaq Stock Exchange and has 75 listed full time employees. 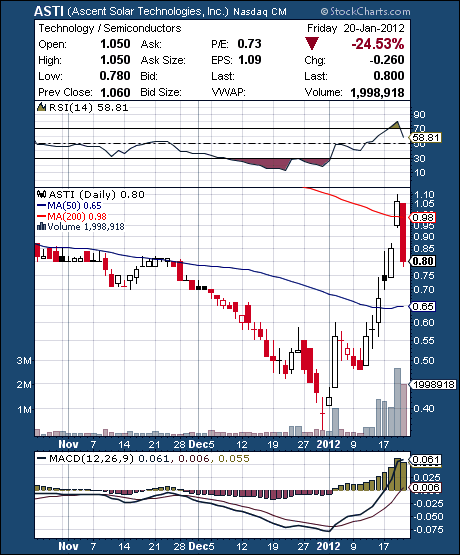 ASTI closing price for the week that ended Friday, January 20, 2012 was $0.80, down -0.26, on volume of 1,998,918. ASTI is trading 36.65% above its 50 day moving average and 1.17% above its 200 day moving average. ASTI is -78.55% below its 52-week high of $3.73 and 122.22% above its 52-week low of $0.36. ASTI‘s PE ratio is N/A and its market cap is $31.16M. Ascent Solar Technologies, Inc.(NASDAQ: ASTI) is just one of the Top 25 Solar Stocks covered here as some of the best stocks to watch. Last updated by Aim High Alerts at January 22, 2012 .